It was a large lovely garden, with soft green grass. Here and there over the grass stood beautiful flowers like stars, and there were twelve peach-trees that in the spring-time broke out into delicate blossoms of pink and pearl, and in the autumn bore rich fruit. The birds sat on the trees and sang so sweetly that the children used to stop their games in order to listen to them. "How happy we are here!" they cried to each other.One day the Giant came back. 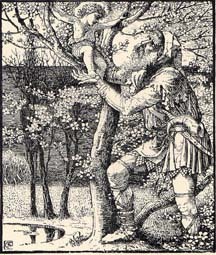 He had been to visit his friend the Cornish ogre, and had stayed with him for seven years. After the seven years were over he had said all that he had to say, for his conversation was limited, and he determined to return to his own castle. When he arrived he saw the children playing in the garden. "What are you doing here?" he cried in a very gruff voice, and the children ran away. "My own garden is my own garden," said the Giant; "any one can understand that, and I will allow nobody to play in it but myself." So he built a high wall all round it, and put up a notice-board.